^ 3.0 3.1 3.2 3.3 Ethiopia. World Economic Outlook Database. International Monetary Fund (IMF). April 2016 [2016-06-07]. ^ CIA - The World Factbook - Country Comparison :: Area. [2013-06-16]. 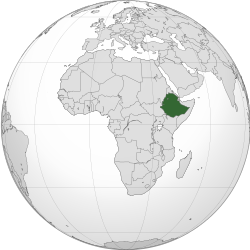 ^ Berhanu Abegaz, Ethiopia: A Model Nation of MinoritiesPDF (51.7 KB) . Retrieved 6 April 2006. ^ Population. Embassy of Ethiopia, Washington, DC (2000–01). Retrieved 6 April 2006. 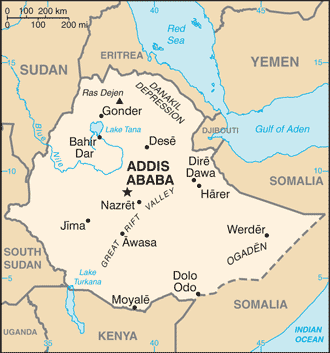 ^ Languages of Ethiopia. Ethnologue. Retrieved on 2012-03-03. ^ 13.0 13.1 埃塞俄比亚概况. 中央政府门户网站. 外交部网站. 2014-04-29 [2016-10-04]. ^ Child Labor in Ethiopia with special focus on Child Prostitution (PDF). Addis Ababa City Administration Social and NGO Affairs Office, Save the Children Denmark, African Network for the Prevention of and Protection Against Child Abuse and Neglect-Ethiopia Chapter. [2010-09-12]. （原始内容 (PDF)存档于2006-12-12）. ^ BBC,The World Today. 24 July 2007. ^ The World Health Report 2006 (PDF). The World Health Organization. 2006. ^ WaterAid UK - Where we work - Ethiopia. www.wateraid.org. [2016-05-20]. ^ 18.0 18.1 18.2 Addis Ababa, Ethiopia. [20 May 2016]. ^ 19.0 19.1 Ethiopia (PDF). WHO. 2008. （原始内容 (PDF)存档于2008-06-24）.